During the period prior to 1900, as tensions within the Norwegian-Swedish union began to escalate, the Norwegian press began to criticise the fact that knights of the Swedish Order of the Seraphim were ranked above holders of the Grand Cross of the Order of St. Olav. Public opinion called for the establishment of a Norwegian honours system that was on a par with the systems in Denmark and Sweden. In response to this, King Oscar II decided to found the supreme Norwegian order, as it was referred to. The Order of the Norwegian Lion was founded on the King’s 75th birthday, 21 January 1904, “in memory of the glorious events associated with Norway’s venerable Coat-of-Arms”. Like the Swedish Order of the Seraphim and the Danish Order of the Elephant, the Order of the Norwegian Lion had only one class. Once the Order of the Norwegian Lion was founded, the Order of the Seraphim ceased to be a common supreme order for the countries in the union. The establishment of a new Norwegian order aroused debate in political circles. A proposal put forth in the Storting called for the national assembly to state its disapproval of the expansion of the Norwegian honours system, but the proposal was rejected by a vote of 54 to 62. 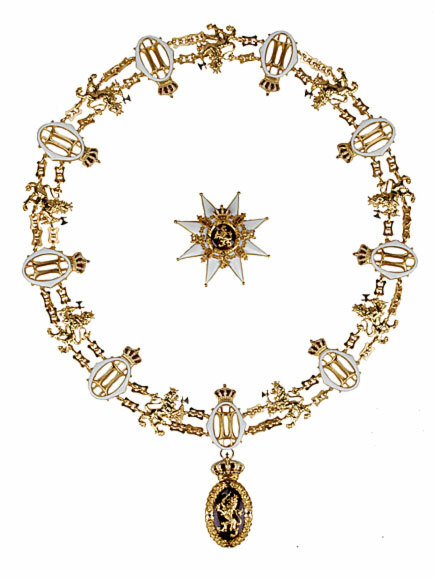 The star of the Order of the Norwegian Lion was fashioned of an eight-point Greek cross in white enamel, which was framed in gold with golden knobs on each point. 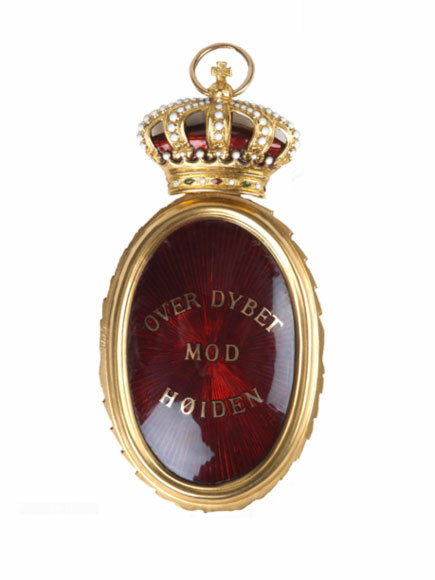 The centre of the cross held a crimson globe adorned with the Norwegian coat of arms and surrounded by a golden wreath and the order’s chain. The Norweigan Lion: Grand cross. Photo: Kjartan Hauglid, the Royal Court. 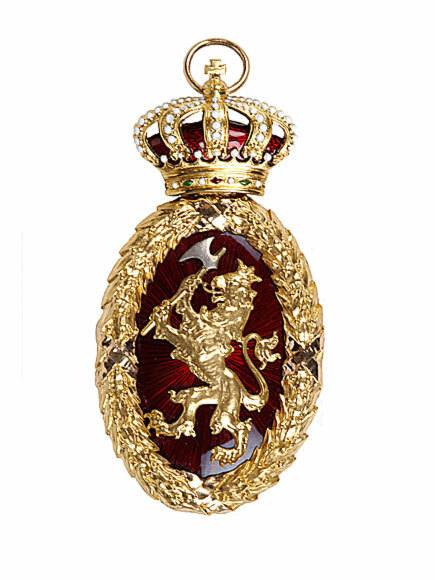 The symbol of the order consisted of an oval medallion of red enamel with the Norwegian lion in gold framed by a golden wreath. The order’s ribbon was blue with red and white stripes at the edge. The King was the Grand Master of the order, and all heirs to the Norwegian throne were to hold the Order of the Norwegian Lion and the Grand Cross of the Order of St. Olav. In addition to the heirs to the Norwegian throne, foreign sovereigns and heads of state, the number of knights of the Order of the Norwegian Lion was limited to 12 persons at any one time. 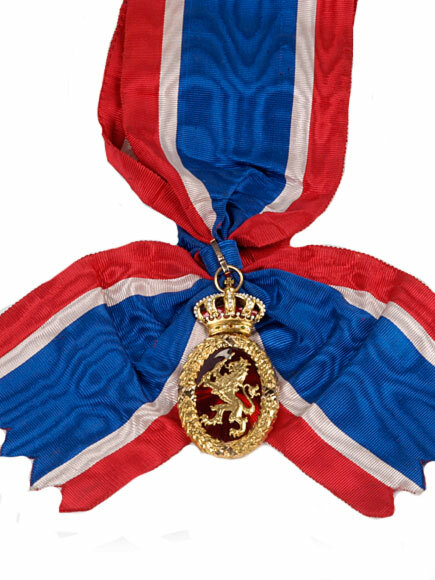 Persons eligible to receive the Order of the Norwegian Lion must have held the Grand Cross of the Order of St. Olav and served meritoriously in a high governmental post, or served the country in another pre-eminent manner. The Order of the Norwegian Lion was no longer conferred after the dissolution of the union between Norway and Sweden in 1905. 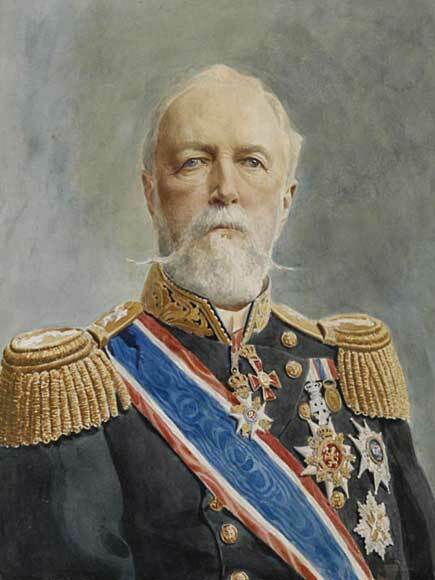 Thus, King Oscar II never had the opportunity to award the order to any Norwegians. The last surviving holder of the order was the Swedish King Gustaf VI Adolf, who died in 1973. 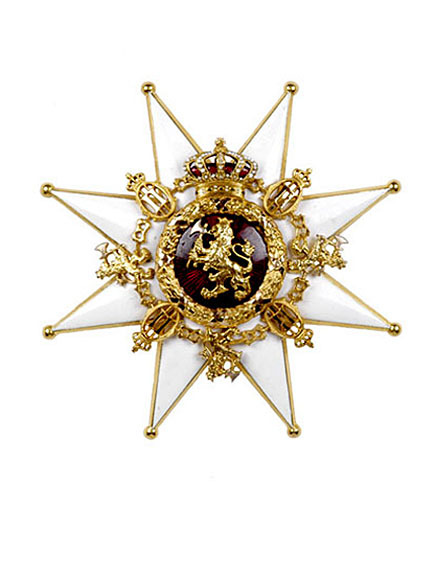 In a revision of the Order of Preference at the Royal Norwegian Court on 29 January 1906, the knights of the Order of the Norwegian Lion were ranked in the same class as holders of the Grand Cross of the Order of St. Olav. King Haakon VII chose not to continue the order, and he never wore the Order of the Norwegian Lion, although the King remained the formal Grand Master of the order.